Thjórsárver Wetlands – Is ‘The Heart of Iceland’ Really Safe from the Nature Killers? Tjórsárver are certainly not safe yet. Since the below was written the Conservatives have taken over the majority in Reykjavík City Council. They hurriedly sold the council’s 45% share in Landsvirkjun to the State. Since that Landsvirkjun have announced that they want to go ahead with destroying Thjórsárver. However, they first want to make three dams in the lower part of the river of Thjórsá. This is also opposed by many people, including locals. Work on the three dams is due to start in the autumn of 2007. They are to provide energy for the enlarged ALCAN factory at Straumsvík in Hafnarfjörður. The people of Hafnarfjörður will vote in a referendum on this enlargement 31 March. It seems the inhabitants of Hafnarfjördur hold the fate of Thjórsá, Langisjór and Thjórsárver in their hands. If they vote in favour of ALCAN the rest of the Icelandic nation and the international community will have to step in. 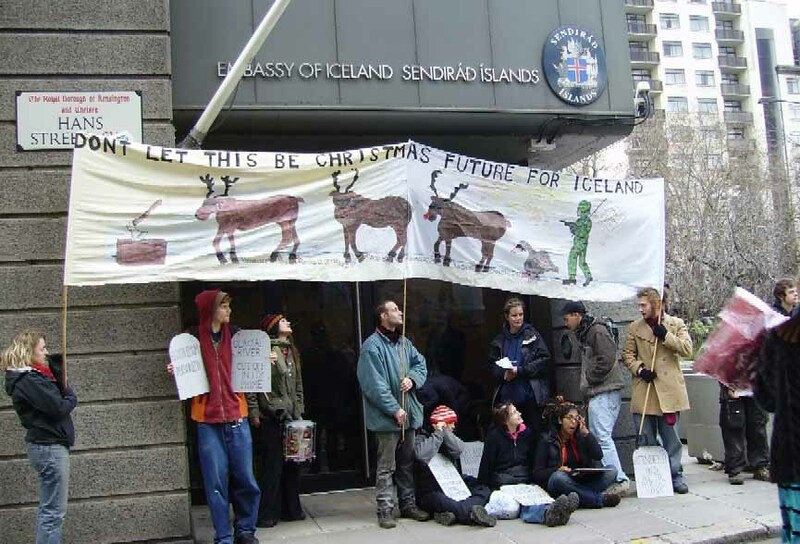 Today around twenty protesters descended upon the Icelandic London Embassy in order to continue their protest against the series of major hydroelectric dam projects due to be constructed on Iceland’s glacial rivers. The power derived from these destructive dam projects is for the sole benefit of the multinational aluminium industry. Companies such as Alcan, Alcoa and Century are expanding their operations in Iceland to exploit these cheap power sources. In the long term Iceland’s unique wilderness will be encroached upon from all directions by heavy industry in the form of colossal dam’s power stations and Aluminium smelters at immense irreversible cost to the natural environment. Twenty teenage activists stormed the offices of the Icelandic Ministry of Industry and staged a sitdown and noise demo inside the ministry for about an hour. 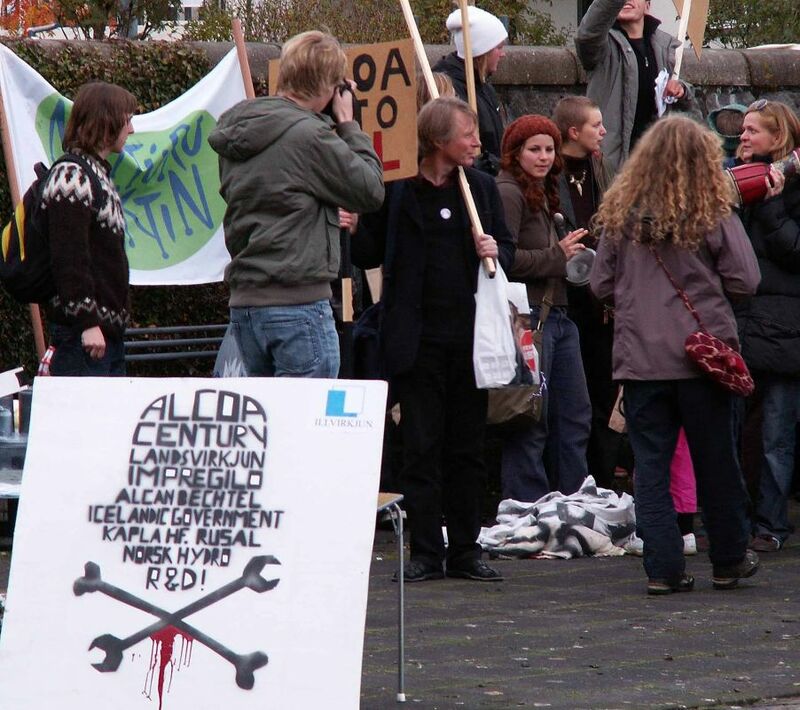 This was to demonstrate against the international aluminium invasion into pristine Iceland. Suddenly the teenagers sat down on the floor and produced tubs of ‘skyr’ (in symbolic support of the activists who drenched delegates at the 10th International Aluminium Conference with the yoghurt like substance) and proceeded to “eat their own words”. The staff of the ministry called the police, who were well and truly ignored by the vigorous youngsters, and gave up sowing their usual brand of disorder. This was a very cheerful protest and a total success. Most of the press and all TV stations turned up for the edifying spectacle and no one was arrested. 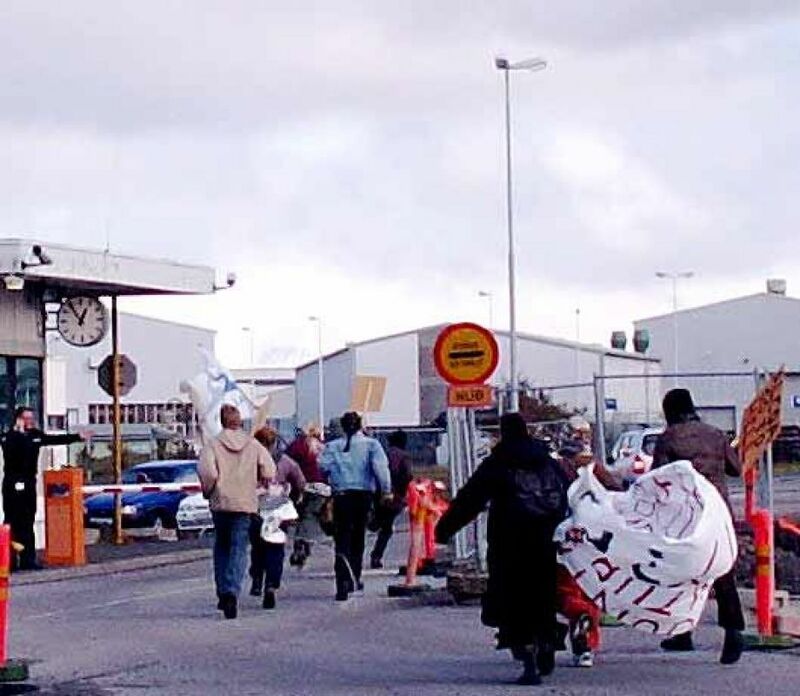 The action coincided most conveniently with a news release from the Ministry of Industry about four spanking new aluminium smelters that are to be built or extended (ALCAN and Century) in the south-west and north (ALCOA) of Iceland, promising amongst other horrors, according to scientists, to make the bay of Faxafloi the most heavily polluted area in Northern Europe. Arms manufacturers ALCOA are deliberating a smelter in the north (possibly in Húsavík) on top of the monster 360.000 tons smelter war-profiteers Bechtel are already building for them in Reydarfjordur in the east of Iceland. Europe’s last great untouched wilderness is to be sacrificed to generate bogus “green” electricity for the ALCOA smelter. The Stop the Dams mega concert, featuring a once in a lifetime collection of artists, was a huge success. At the concert the dates to the next protest camp at the Kárahnjúkar project were announced, 21st July. Hundreds if not thousands of Icelanders are expected to attend. The destruction will be stopped! Almost 6,000 people partied in protest against the devastation of Iceland’s wildernesses on January the 7th. The lineup included KK, Björk and Zeena, Múm, Sigur Rós, Magga Stína, Rass and Dr. Spock, Damien Rice, Mugison, Lisa Hannigan, Hjálmar, Ghostigital, Damon Albarn (from Blur), Ham, and Egó. Performance artists and film-makers were also among the nearly two hundred artists that contributed to the event. Two of the activists who took part in the June 2005 Hotel Nordica ‘skyr’ action at the International Aluminium Conference, have recently been sentenced in Reykjavik municipal court to two months in prison suspended for two years and a £6000 “cleaning up bill”, fines and expences. Hotel Nordica is frequently host to international heavy industry conferences. According to the owners of Hotel Nordica it cost over £5000 to hire a carpet cleaner for two hours! The original claim of Hotel Nordica (owned by Icelandair) was £55.000. ‘Skyr’ is a perfectly harmless jogurt like substance and nobody was hurt during the incident. 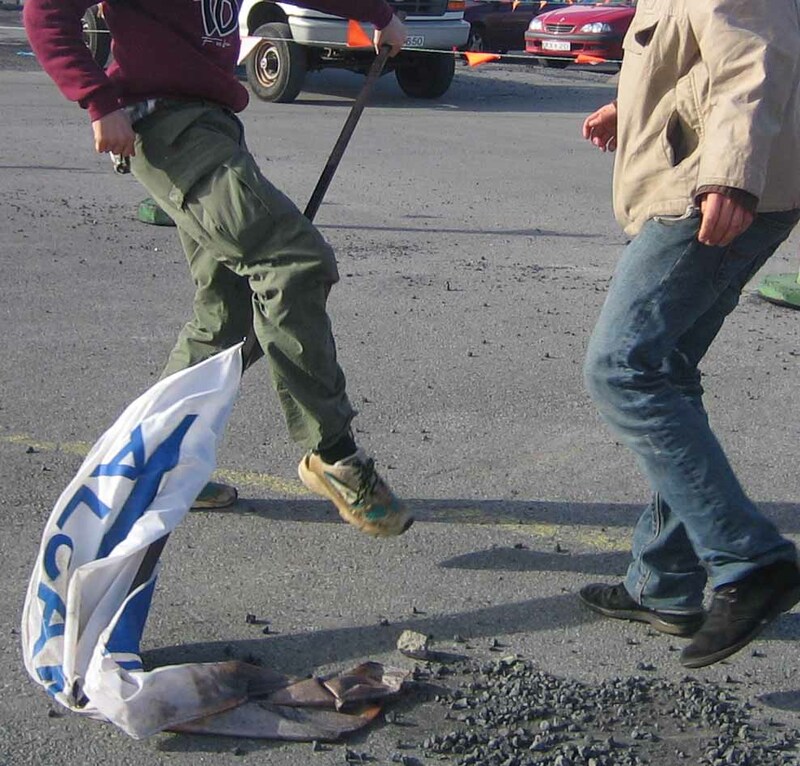 The action was a prelude to the Saving Iceland international protest camp which took place in the Icelandic higlands near the building site of Kárahnjúkar dams. The Kárahnjúkar dams are being built to provide bogus “green energy” for a 360.000 tons ALCOA owned aluminium smelter which is now being built by war profiteers Bechtel in the east of Iceland. This project alone threatens to destroy the largest pristine wilderness of Europe. This time around Reykjavík was host to an International Conference on Anode Rodding Plants for Primary Aluminium Smelters. At the conference, which was largely funded by Icelandic tax payers’ money, Iceland was yet again being offered up for sale as a cheap country for aluminium smelting, while undesirable points of view were unwelcome. On the morning of 21 September delegates woke up to a noisy bunch of protestors standing outside the Hotel Nordica blowing whistles and horns and banging away on pots and drums, just to remind the delegates and their hosts that there is active and unfailing resistance to the systematic destruction of Icelandic nature and the increase in pollution of our environment. Same day in the late afternoon the representatives of the most polluting industry in the world were treated with champagne and canapés at the Reykjavík Municipality. At the same time an International Transport week was being celebrated in Reykjavík; its stated purpose was “to raise awareness among the public on the necessity of reducing pollution caused by traffic”. Greenhouse gas emissions from the ALCOA smelter in Reyðarfjörður will be equal to that of 172.000 cars; the entire car-fleet of Iceland! 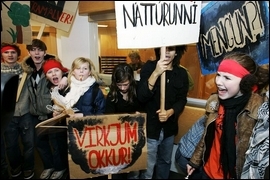 Together with NatureWatch and youngsters of Ungrót, Saving Iceland organized another noise protest outside the Municipality as the mayor welcomed delegates of the conference. A heavy police presence was deemed necessary to protect the polluting fat cats while they sipped champagne and listened to fawning speeches of Icelandic dignitaries. For two hours environmentalists put on street performances and vigorously banged on their drums. A large window on the side of the building gave the delegates a good view of the crowd and their banners. mooning at the aluminium sophisticates! Delegates of the conference visited the aluminium smelters at Straumsvík and Grundartangi. Saving Iceland went to the ALCAN factory to warn them what aluminium smelting can do to their health. Out of other peoples land! Once he’s done what he is about to start? 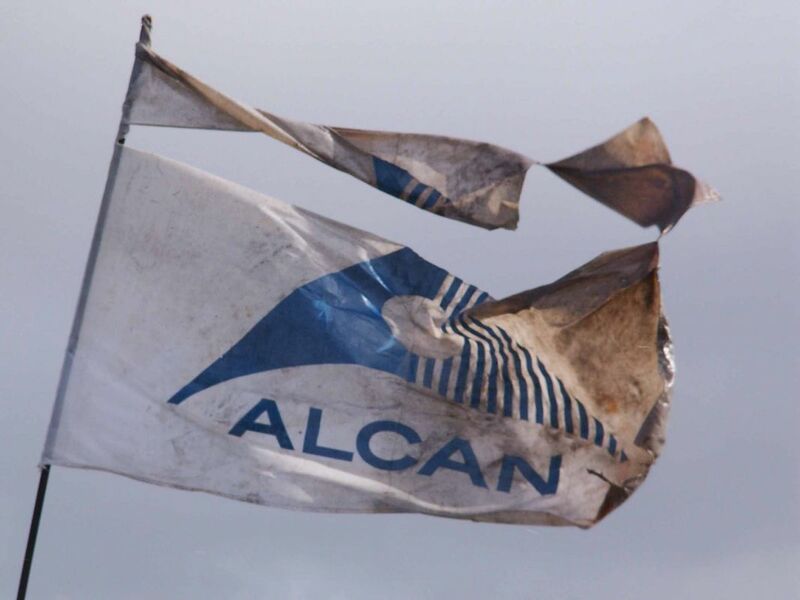 Meanwhile ALCAN’s flag was stamped on, torn and finally burnt. Two people were illegally arrested for throwing a harmless and perfectly legal smoke-bomb into an open field. One of them was arrested for driving a “stolen” car from the protest, even if the owner of the car gave immediate proof thathe had his permission to drive the car! Both were held for five hours and released without charge. “Today delegates of the 3rd International Conference on Anode Rodding Plants for Primary Aluminium Smelters in Reykjavík are due to visit the aluminium smelters at Straumsvík and Grundartangi. Little attention has been paid by the conference to the negative impact and harmful effects to people’s health of aluminium smelting and related types of processing. At this conference, which is partly funded by Icelandic tax payers’ money, the Technological Institute of Iceland, City of Reykjavík, the Ministry of Industry, Icelandair and the National Power Company, Landsvirkjun are among the sponsors and participants, Iceland is yet again being offered up for sale as a cheap country to smelt aluminium, while undesirable points of view are unwelcome. We wish to convey the message to the conference guests that there is active opposition in this country to the further build-up of heavy industry, and point out the impact that this build-up will have on the local people and on the environment of those of us who live on Faxaflói bay. 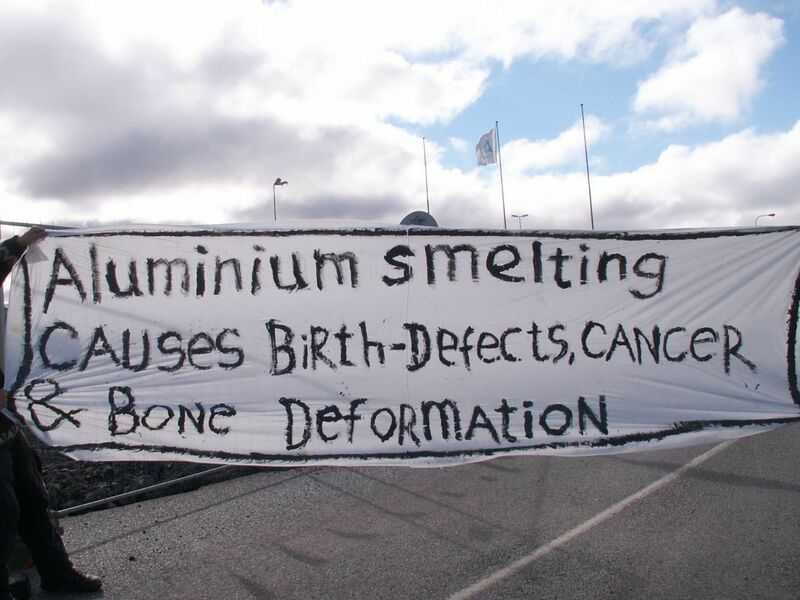 Our protest is designed to express our opposition to the proposed expansion of the aluminium smelters at Straumsvík (ALCAN) and Grundartangi (Century), as well as the construction of an anode factory at Katanes (R&D Ltd.) and yet another Century smelter at Helguvik. We find it wholly unacceptable that the Faxaflói bay should become the most highly polluted area in Northern Europe, yet this is what will happen if these plans go ahead. 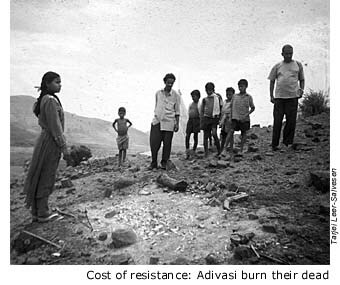 We also wish to show our solidarity with the people who have suffered from ALCAN’s immoral and inhuman working practices around the world; from the workers at Straumsvík who have contacted us to describe their unacceptable working conditions and the abuse of employees’ rights, to the inhabitants of the Kashipur district of India who have been fighting for twelve years against a planned bauxite mine and ALCAN aluminium plant which will force at least 20,000 people to leave their farm lands and will pollute their water supply (see www.saanet.org), not forgetting the residents of Hafnarfjördur in Iceland who are demanding a local referendum on the expansion of the ALCAN plant. Did the Icelandic authorities think that their terrorizing of legitimate international protesters would stamp out all resistance against their criminal destruction of the last great European wilderness?! If so, they were wrong!